Thank you for showing me what true friendship looks like! We all have one whether we realize it or not. It might be a co-worker, a college roommate, etc. They might be that person that you meet, and all of a sudden they make you view things in a different light than before. They just make your life better by being in it. You have done that for me. I was introduced to you by my brother. When you came into my life, I was in a place where I thought everything was good. I had friends and a job that I loved. I thought all was good in my world. As I have stated in a previous article, I have a very low bar of standards of what I think a good friend is or should be. At the very start of our friendship, I wasn’t so sure because I thought my friendship history would repeat itself. I was afraid that I would become friends with you, grow really close and a few years later, you would just be gone. That was the cycle I had experienced that needed to break. You broke that cycle. It took a lot of convincing on your part that you would stay. I had to trust you and believe that this time it would be different. Do you know what? It was. I trusted you. It took me a while but I did it. It’s not that I didn’t want to, but that cycle was going on in my head. 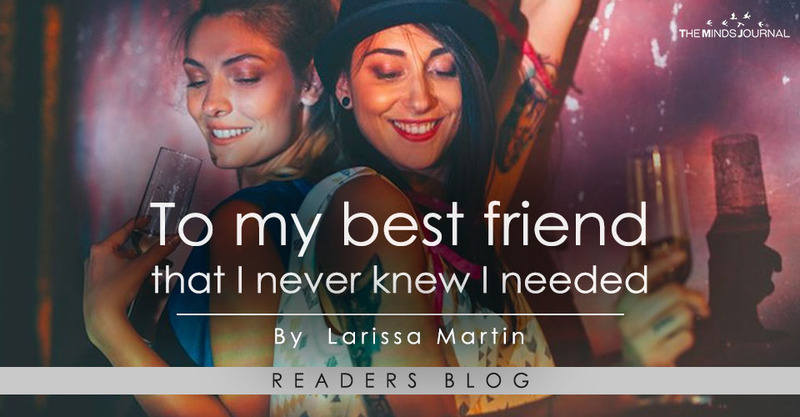 As our friendship grew, I started to take a step back and look at other friendships differently. They were ones that I originally held to higher standards and I shouldn’t have. You helped me see that. I noticed other things about myself as well. I noticed that I really do work too much. I work an unhealthy amount and I don’t take time for myself as much as I need to. I felt like I didn’t deserve anything. I felt like other people deserved to be taken care of more than I do. That’s the kind of person I am. That has changed quite a bit because you beating that into my head. You have changed my life in ways I can’t even express. There aren’t enough words, nor is there enough time to tell you how much you mean to me. and how our friendship changed me for the better. I think you came in to my life for a reason. For what reason, I do not know. I might not ever find out. I will tell you this, people come into our lives for a reason all of the time. Sometimes they come in to teach us something or to give us the support we need at that time. Sometimes they are there just to show us trust. I believe you came into my life for all of those reasons. I mentioned that you showed me what real friendship is, and how it’s supposed to be. You showed me that friendships shouldn’t be forced nor should they be a one way street. This friendship is one of the best and real healthy friendships I have had. It may be the best I ever will have. I think people need to stop forcing friendships and just trust in others more. They should stop holding them to a higher standard than yourself. You are worth it. If we all stop looking for friends, we may find the best friend we never knew we needed. It’ll happen when we least expect it and they will change us for the better. If it wasn’t for your encouragement, I wouldn’t be writing this right now.